The hammer shark is a very particular animal, with a morphology that is far from that of the other sharks and some behaviors that are decidedly different and they constitute still today a mystery. Known in the first centuries later Christ, was considered a real beast, to fear and to avoid. The meeting in sea with the hammer shark was considered cause of great adversity and its particular morphology gave birth to numerous legends.. There are different kinds of hammer shark, with middle dimensions of 200-250 cms, up to the 600 cms of the great hammer shark hammer Sphyrna mokarran. 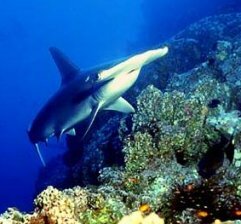 The hammer shark swims in tropical and subtropical areas and, according to the kinds, it is found in oceanic waters, next to the coral barriers and also in proximity of the coast, coming to swim in low backdrops.. The hammer shark is present also in the Mediterranean Sea, some samples would have been signalled in the western Mediterranean, near the Spanish coasts, Moroccan and Algerian. In Italy there would have been sightings in the waters of the Ligurian Sea and in Sicily. The hammer shark owes its name to the particular form of the head, flattened and lengthened to the sides, that form two side expansions, which are sustained by important changes of the inside skeleton. The form and the length of the hammer change in base to the different kinds. The function of this particular morphology is not completely clear and today there are only some hypotheses. The biologists think to an improvement both to hydrodynamic level and sensorial power. 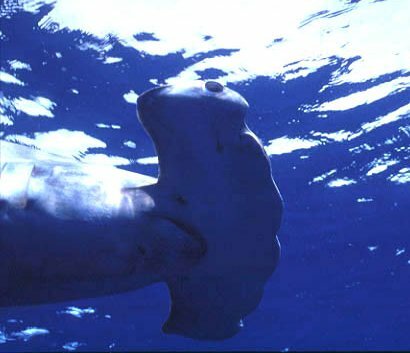 The hammer, being flattened, increases the surface of the anterior part of the shark and it opposes downward the push of the body during the swimming. Perhaps not by chance, among all the sharks, the hammer shark is the most agile and rapid and during the hunting becomes an infallible raider. The presence of the hammer would increase besides the sensorial perception: the sense of smell, the sight, the perception of the waves of pressure and the elettro-magnetic fields would result more efficient and functional.. In fact that in blood's presence in water or however wounded fishes, the hammer sharks arrives for first in the proximities..
Also the eyes are found to the extremities of the hammer and this greater distance would favor the stereoscopic sight with a superior ability to understand the distances and the positions in water. The side line, organ with which the sharks and the bony fishes perceive the waves of pressure, that races along the sides of the animal, continuous in the hammer shark in the region of the head and also in this case it would result more functional. Finally also the "sixth sense" of the sharks, what allows them to perceive the elettro-magnetic field of the living organisms, would result strengthened as these sensorial cells, the Ampullae Lorenzinii, are diffused in the area of the head and therefore mostly present in this fish. During the hunting the use of the hammer as real tool has been found besides for stunning and to immobilize the prey before being devoured. The hammer sharks are nourished of fishes, sharks of smaller dimensions, molluscs cefalopod and shellfishes. The documented attacks to scuba divers or skin-divers are very little and also in presence of baits the hammer shark doesn't show him particularly aggressive; a dangerous kind remains however potentially because of the dimensions and of the mighty teeth. These animals show to have a very advanced social life while as a rule the most greater part of the kinds of shark is solitary and the contacts with other samples seem to be very poor. Different species of hammer shark has been observed in numerous flocks, up to 500 sharks. Perhaps these animals don't have to reunite themselves in flocks to avoid the raiders and probably they don't even do it for reproductive motives.. the mystery remains..
Is certain instead that the hammer shark shows to be an excellent raider, to the vertexes of the food chain, perfectly evolved and suited for the environment in which alive and able of advanced relationships with exemplary of the same kind. It is not therefore a beast or a monster to be feared and on which to create legends but a marvelous inhabitant of the submarine world..